I graduated in architecture at the University of Moratuwa 35 years ago and did my master’s degree in architecture at the University of Sydney. I have more than 30 years architectural experience in Australia and have been currently working for Group GSA Architects as an associate architect for the last 16 years. We are aware of the vision of the Colombo International Financial City (CIFC) project; it will become a global financial centre for the new millennium. There may need to be a unique perspective of the nature of a Financial Centre in a modern context, through which we weave our project experience. According to the Master Plan model of SOM (the American architectural, urban planning and engineering firm), CIFC – will be a cultural hub; must have mixed use of buildings, such as commercial and hospitality venues, restaurants, theatres, cinemas, retail, hotels, high density residential and transport links; have advanced technologies; and will be an Intelligent City. We have some parallel in our experience in the Barangaroo precinct in Sydney and CIFC. In our experience we find out that both Barangaroo and CIFC have the similar characteristics as both developments are an expansion of the existing central business districts. 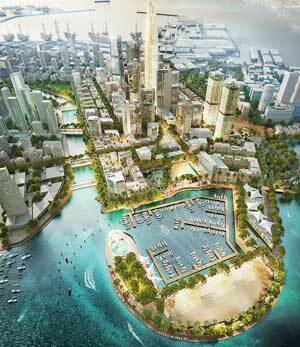 Similar to Baranagaroo development, there should be a focus on mixed use concept for CIFC as a key to success. There are a variety of office types that we have worked are relevant to CIFC; they are sky scrapers and campus type of offices. Sky scrapers such as Barangaroo Towers – 7.7 ha mixed use 40-50 storey high towers consisting of approx. 490,000 sq. m. gross floor area comprising commercial, residential, retail, leisure, hotel, restaurants and cafes. It is really nice to have places for people to stay, eat, dine and shop. The retail offers bring life to these precincts and should not be excluded in the financial city. We worked in numerous locations bringing these sorts of functions to town centres. Bringing speciality shops into these places are important; we used to assist bringing important retail and cafes such as Expresso. It is important that we have fun in these places and the people are comfortable. Spaces for people need protection from the weather; and people need privacy as well. Hotels are important; it can be futuristic, resort like or contemporary business-like specialised hotels. An important ingredient for all of these spaces is to maximise residential usage to bring people to these places when work is finished. We will need to have important and good financial tenants who should occupy several floors. CIFC needs to focus on connectivity both physical and electronic. We are very much connected globally and daily experiencing the fast-pace of advancing technologies. We need to create intelligent cities these days; so that we can be kept safe, kept cool, protected and connected to the world. 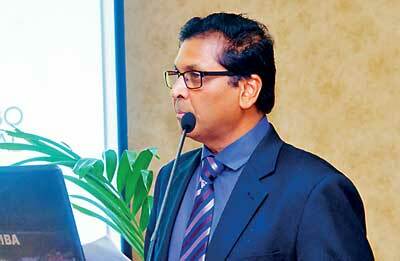 Of course that is the promise to the Colombo International Financial City to run a strong community in the future.